Before you place your order, please ensure that you are ordering the correct size. If you need help determining what size to get, feel free to contact us and we will be more than happy to help. You can reach us via email: shop@eurohorsedesigns.com or phone: +1 785-330-3009. Our phone hours are 6am to 3pm Eastern US time. We answer emails very quickly, usually right away, and never longer than 12 hours after receipt. 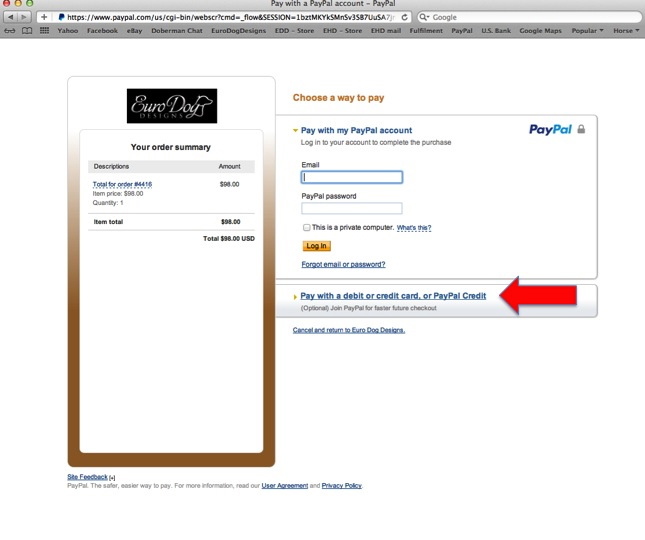 Payments can be made with either a Paypal account or a Credit Card. If you don't have a Paypal account, when redirected to the payment page, just click on the link marked with an arrow in the image below, and you'll be redirected to a page where you can enter your credit card details. We offer Free Shipping on orders over $100 to the continental USA. Shipping is with either UPS or USPS so it's no problem shipping to PO Boxes. When shipped, your package will usually reach you in 3-7 days. If you want your order quicker, you can choose to pay extra for UPS 2 Day Air or USPS Express mail. Orders placed before noon Eastern Standard Time will usually ship the same day, if your order is in stock. If one or more products in your order is out of stock, we will email you with a timeframe plus offer to change the color etc. Urgent orders can be accommodated until 1pm. When we ship your order, you will receive an email with a Shipping Confirmation and an email with a Tracking number. We ship worldwide. International Shipping charges are based on weight and will be calculated at checkout. Please be aware that only packages shipped to the countries listed below are trackable all the way. All other countries do not accept Electronic USPS Delivery Confirmation, and therefore the package is only trackable as far as the US border. If you choose this shipping option you assume the risk of the package being lost, as soon as it has been handed over to the USPS. If you do not wish to assume this risk, please choose another shipping option. Please be aware that customs charges can be added in customs to international orders. You will be responsible to pay these charges. It varies from country to country how much these charges are. Packages picked out in customs can be delayed significantly, up to two months depending on country, so please be patient. In case you order the wrong size or the product is just not what you wanted, you will need to return it. Email us at shop@eurohorsedesigns.com letting us know why you want to return and what you need instead. Make sure the item is in new and unused condition with all tags attached. You are also more than welcome to place a new order for the item you want, and I will issue a refund for the return when we receive it. If you are returning an order for a refund purely due to changing your mind, there will be a $5 restocking fee, plus any free shipping will be deducted from the refund. Please ensure that the product you are returning is in new condition including tags and packaging. All items must be clean and unused. Please don't return with make-up residue after trying them on or reeking of cigarette smoke. You would not want to receive an item looking or smelling like that, so please don't expect anyone else to. I will not accept any returns in less than re-sellable condition. So basically, return the item as you received it. We ask you to return the item as quickly as possible and no later than 30 days after purchase. Refunds will NOT be given after 60 days. If you need help with the process, please don't hesitate to contact us either via email, shop@eurohorsedesigns.com or by phone, 785-330-3009. We are more than happy to help.